RTS games have always caught my attention in a very special way. There is something alluring in the role of a grand general, sending your minions forth to pave your way to glory with their bravery and bodies. I have never really thought much of the usual suspects of the genre, Starcraft and its kin, having preferred tactical thinking over inhuman APM stats. A significant part of my preference of brains over reflexes can be attributed to the dusty cardboard boxes I have stashed in my basement, each one filled with meticulously painted little plastic men. Next to these boxes are the rest of the evidence: pouches filled with dice and counters, hefty rulebooks and lovingly crafted pieces of stryofoam landscape. I confess, I used to be a tabletop wargamer.That being said, a release by French developer Eugen Systems called Wargame: European Escalation caught my eye a few months before the release. This was something new, mixed with something very old: W:EE is an old school tabletop wargame imagined as a real time strategy video game. This creates a very peculiar kind of game, one that manages to capture the deliberate pace and emphasis on pre-planning of the turn-based games of old while keeping the tension and action expected of a real-time video game. At first glance, Wargame: European Escalation doesn’t seem to differ that much from other contenders in the genre: you order your little virtual troops across a surprisingly dull-looking stretches of middle-european countryside using the usual RTS interface. The maps are are blotched with control areas, which when captured, will provide you with a steady flow of points you can use to call in reinforcements. It seems all so very basic and seen-before on the surface. 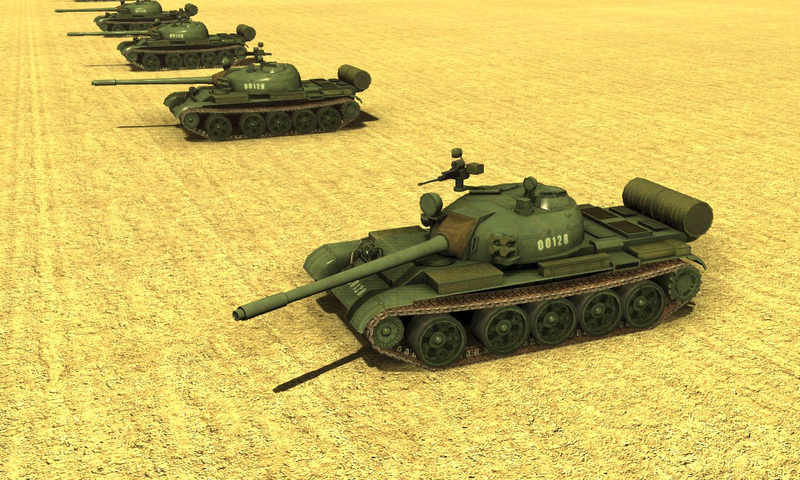 Close comparisons could be drawn to World in Conflict, another cold-war-turned-hot RTS. But, do not be fooled. Beneath the thin facade W:EE has its roots deep in the wargaming tradition, and from there are a multitude of clever mechanics borrowed that lift W:EE above the masses of mediocre. The first and most obvious of these is the unit selection. Wargame: European Escalation covers a ten-year-stretch of history between 1975 and 1985, and pitches the two military superpowers of the time, NATO and Warsaw Pact, against each other in a number of almost-historical scenarios in central Europe. 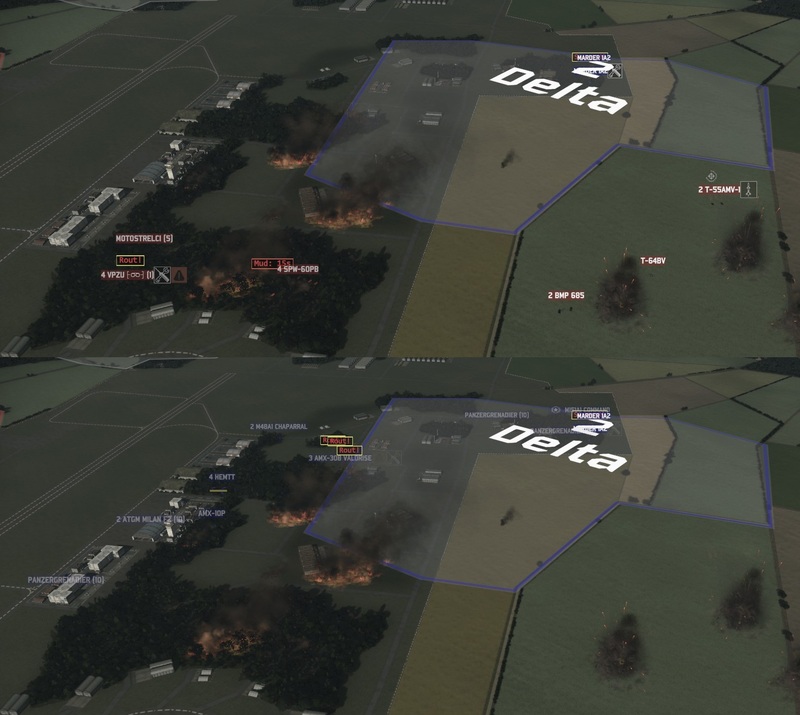 The game contains over 300 different units, divided between the two factions (and their respective nations) and seven different categories from logistics to helicopters. Each unit is modeled with loving precision, both in their gameplay statistics and their 3D-modelled representations in the game proper. The level of variety is stunning: even within such niche unit as flamethrower infantry for Warsaw Pact, you can choose between two nationalities (USSR and Poland) and twenty different troop transport options (11 for USSR troops, 8 for their Polish comrades). Each unit has a datasheet of several dozen different variables, from weapon statistics to fuel consumption. In addition, each unit’s name is an incomprehensible tangle of numbers, letters and dashes to the uninitiated. For example, can you tell me, from the top of your head, what is BTR-152E ZPTU-4? I didn’t think so either. The staggering amount of options available for your choice of troops is simply absurd, and fires off instant flashbacks to the days when I used to thumb trough my tabletop wargame rulebooks, cross-referencing pages upon pages of tables and unit rule descriptions. You see, Wargame: European Escalation, like it’s predecessors in the wargaming world, takes matters of historical accuracy and variety seriously. Thankfully, it’s not all insanity and overwhelming complexity right off the bat. W:EE might be serious about it’s subject matter, but it’s not aimed only to spreadsheet-fetishists. The game takes hints from it’s tabletop roots, but transcends it’s predecessors by smoothing and streamlining things with clever application of game mechanics. When starting the game, over 90% of the troops are closed behind the best content unlocking scheme I’ve yet to encounter. A beginner player is only allowed to field the most basic troops to battle. More units are unlocked using Command Stars, which are generously awarded from both completing single-player missions, and playing online games against other players. This is not a free-to-play title where grinding XP to get to the good stuff is merely a ploy to milk the player with microtransactions. The Command Star mechanic serves a very clear purpose, and it serves it well: protecting the player from being overwhelmed. There is a very natural flow to the introduction of new units, with the player being to able to unlock a couple of new units after each mission. Even with Command Star rationing, choosing from 150 different units per side is still an unwieldy concept in a real-time game, so W:EE imposes limits on the variety of units you can call in during gameplay. In single-player campaigns the selection is dictated by the mission, but multiplayer games introduce the concept of unit deck. In essence, you pick a limited selection of units from your pool of unlocked toops as your “deck”, which then in turn dictates which units you are able to field in multiplayer matches. This creates an involving metagame with obvious similarities to both Magic the Gathering and traditional wargames. You can create decks to fit different playstyles, tactics and maps, endlessly customizing and honing your own battalion to suit your needs. It’s definitely a feature that is not going to appeal to every gamer, and it does reek a bit about the spreadsheet-fetishism I talked about earlier, but it does add a very compelling layer of careful planning on top of the actual gameplay. It is a rare game in which I’ve spent more time in the menu screens than in the actual game proper, and enjoyed my time so thoroughly. It’s like filling out army lists back in 7th grade! Of course, it’s the actual gameplay, the interactive real-time action happening on your computer screen, that makes or breaks a game. And it is in this very gameplay that Wargame: European Escalation manages to blend the tabletop tradition with modern RTS sensibilities seamlessly. Each multiplayer game has a set deployment points value, for example, 6000 dp, which is distributed to the players in the beginning of the game. Deployment points are the currency of W:EE, used by the players to buy their initial troops and to call in reinforcements during the game. As described earlier, additional deployment points can be gained by capturing and holding control areas on the map. Certain control areas situated in on the edges of the map can also open up new avenues for your troops to arrive into the battlefield, opening up new tactical possibilities. As a yet an another interesting implementation of tabletop features, it needs to be noted that Wargame: European Escalation hands you all the keys to the kingdom right at the beginning of the game. There is no technology upgrades, no advanced units you need to wait for. You get the lion’s share of deployment points right up front, with every unit you have chosen for your deck available right from the get-go. Many RTS games put the emphasis on handling your economy and resources, with the actual battle between the troops being the result of your resource-juggling. Wargame: European Economy instead lets you place the core of your forces right away, shifting the focus from economy into the actual units acting out their roles in this grand theater of war. The core gameplay itself is streamlined and smooth, sitting comfortably on the line between realism and abstraction. The commands you can issue to your troops are sparse: you can order your units to move to a location and to attack enemies. Tracked and wheeled vehicles can be issued with a special command “Move Fast”, in which they will prefer to use roads instead of trundling straight trough the landscape, which dramatically enhances their movement speed. Helicopters can be ordered to change between two altitudes, and transports can be told to either load or unload infantry units. With the addition to turn on and off different weapon systems on your units, that is the entirety of verbs at your disposal. There are no special abilities to take in account, no micromanagement of different combat stances. Units take cover independently, attack enemies in their visible range and generally behave like trained soldiers on a battlefield. A level of micromanagement exists when the units are actively engaged in combat, but it’s not exceptionally intense. This sort of high-level hands-off approach is needed, when you consider the scale of the game: there are usually hundreds, if not thousands of infantry units on the map at one time, with dozens of tanks trundling around and several squadrons of helicopters zooming across the skies. The basic unit you command is a platoon, with up to 4 vehicles or 40 infantry units, and you have maybe a dozen of these platoons in your command at one time. Multiplayer matches are usually team-based with up to 8 players in two teams facing off, which makes for some impressive replays when there is so much stuff going on at the same time. Viewing all this from the highest camera elevation, where the units are reduced to sterile NATO-standard rectangles, evokes vivid memories of small cardboard chits being moved across the table while a group of serious-looking men loom over them like a pantheon of slightly-nerdy looking gods of war. 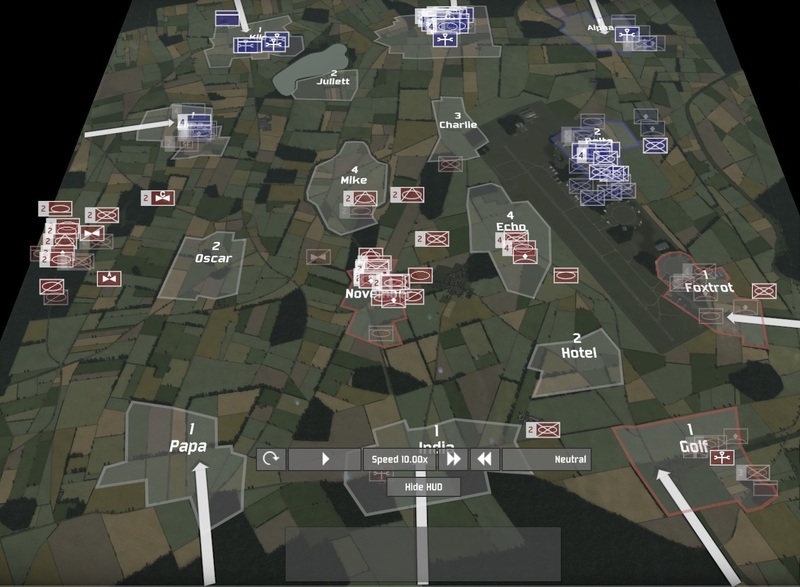 Even though Wargame: European Escalation goes to great lengths in modeling the most minute differences of it’s massive troop selection, the actual gameplay has a comfortable layer of abstraction on it. Combat is based on percentage chances calculated directly from unit statistics. There is no physics simulation, no complicated hit location system. Tanks and vehicles have four simple hit locations (front, sides, back and top) and a number of hit points, while infantry units have just the amount of troops left in the squad. Critical hits cause temporary debuffs that inhibit the unit’s actions. It’s very simplified and high-level, similar to the user interface. Like the more serious tabletop games, Wargame: European Escalation aspires to create realistic scenarios and outcomes, even if the actual fighting is not based on real-world mechanics. It could be described as realism from a bird’s view, as opposed to grassroots level of accuracy. This might lead one to think that the gameplay is simple, but it is yet another ruse; the meat of the gameplay is not in units shooting at each other. In fact, by the time your tanks open fire, the decisions have already been made and you are merely observing the results of your actions, watching a line of carefully placed domino tiles topple over. The true strategic depth of the game is hidden within one word: reconnaissance. Let’s discuss recon and intelligence. The nature of the game is such that almost any unit is capable of utterly destroying almost any other unit, given a chance. The most humble infantryman is capable of blowing up the shiniest and most expensive tank in the game with their feeble RPGs, if they manage to get close enough and position themselves correctly. This is where recon comes to play. The game has an utterly merciless and extremely intricate system of line-of-sight. You have no radar, no magic X-ray vision. Most of your units only can see so far, and the maps are generously littered with LOS-blocking obstacles. This is where reconnaissance units come to play: lightly armored units who have the simple ability of seeing much further than others. Knowing where the opponent is located while keeping your own units hidden is the greatest advantage one can have while playing this game. Maneuvering your units to advantageous positions is the meat of the game, the true challenge. Knowing that your opponent is trying the same makes the game tense and stressful. Does my enemy have anti-armor infantry in that forest, ready to destroy the tanks I am about to send forward? Can I slip my attack helicopters past his recon units to wreck havoc upon his artillery? Where the hell is his attack force? Same situation from both Warsaw Pact and NATO point of view. At this point, I think it’s good to talk briefly about how you win a game of Wargame: European Escalation. You might be excused for thinking that you win a match by holding onto the previously mentioned control areas, like in so many other games that feature area capture. You would be wrong. You win the game by having more victory points than your opponent by the end of the game. And how do you gain these victory points? By destroying enemy units. When destroyed, an enemy unit gives out as victory points the exact amount of deployment points it costs to buy that unit. It is this elegant and simple victory condition, one that many tabletop gamers are so familiar with, that gives the game much of it’s character. Suddenly, you start to care about your units so much more. Suddenly, the price tag on the units is so much more important. Losing an expensive tank is no longer a wasted pile of deployment points, it’s also a pile of victory points awarded to your enemy due to your incompetence. The mighty AH-64 Apache gunship helicopter is no longer merely a flying angel of death, ready to rain Hellfire rockets and white-hot gatling rounds upon unsuspecting communists. It is now also a floating pinata filled with 165 delicious victory points, only waiting for a 10-point anti-air squad to take a whack at it. Your greatest assets become also your greatest liabilities. At the same time, you start to look at the cheaper, less obviously powerful units and start to wonder what you could achieve with them. In the end, it’s all about destroying enemy units, and the best way to destroy units in this game is to expect where he will be while being where he won’t expect you to be. Having only the units with largest numbers attached to them and waiting for them to win the match for you will lead to nowhere but your demise. This does wonders to the pacing of the game. The maps are so large and filled with so many hiding places, that you cannot simply keep an eye on everything. Rushing forward in large blobs is suicide, since a couple of well-placed defenders can always repel an attacking force many times their size. Retreating is a valid tactic, since it’s more important to keep your units alive than to hold on to an arbitrary piece of land. The game starts to remind you of some perverse version of chess, where your playing pieces have been replaced with 1980’s military hardware, and you cannot see your opponent’s pieces before it’s too late. It is real time strategy, sure. Seizing initiative from your opponent is important, as well as reacting quickly to the threats he poses. But even then, when you end up in situation where you have to act on instinct rather than trough consideration, it’s because your opponent forced you into it. The game has this ponderous feeling of turn-based combat to it, created by the combination of the line of sight mechanic and the victory condition. You see your opponent make a move, and then you counter that move with one of your own. You fence with your opponent using your troops as proxies, advancing and retreating, trying to find an angle of approach he hasn’t considered, trying to read his mind. It’s a macabre dance of destruction with the player as the choreographer, performed by roaring steel beasts and little men in uniforms. Did I mention the game looks pretty nice aswell? Also, my favourite tank! And it is in this very dance, this mindgame, that the true beauty of the game reveals itself. In the end, Wargame: European Escalation manages to capture the essence of a tabletop wargame by being nothing more than a battle of wits, pitting military minds against each other on a simulated battlefield. The game is not without its flaws, and balancing all those 300 units must be a nightmare, but it is the best depiction of the Great War That Never Was I’ve encountered, and a strong addition to any RTS-enthusiast’s library. This entry was posted in Articles and tagged rts, tabletop, wargame on September 26, 2012 by jarloz. Agreee on all fonts! WEE is the best RTS game made so far. Great depiction of the experience and of the essence of the game. It is fun because it is strategic. A real-time war chess game.